It is clear we’re in the midst of Beauty and the Beast Season. The long-anticipated live-action remake of Disney’s animated film opened a couple of weeks ago. 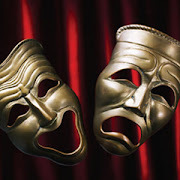 Currently, Toby’s, the Dinner Theatre of Columbia, is serving up the vaunted musical version. And what a job they do! 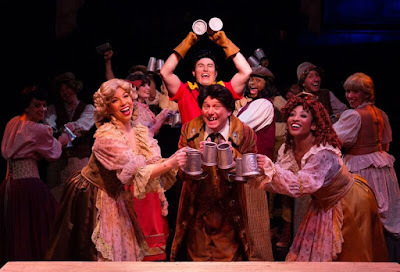 Even with Toby’s already high bar of consistently churning out quality musical theatre productions over the years, this mounting of Beauty and the Beast soars to a new level. 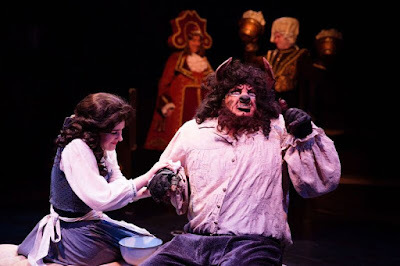 Combine that with brilliant, extravagant period costumes designed by Lawrence B. Munsey, the imaginative set, set pieces, and props by David A. Hopkins, Lynn Joslin’s lighting design and the precise staging, Beauty and the Beast is far more beauty than beast. Several hundred costume pieces are employed including colorful 18th century gowns, dresses with hoopskirts, as well as attire for wolves and the beast himself. Prosthetics and other devices are used to outfit the enchanted objects—clock, tea pot, candelabra, etc. There are great challenges in designing such costumes but Mr. Munsey succeeds spectacularly, which fortifies the aesthetics of the show. The musical, which opened on Broadway in 1994 was based on Oscar-nominated Disney’s 1991 animated feature film with the same name. It became the tenth longest ever running musical on Broadway. Beauty and the Beast featured the Oscar-winning score with music by Alan Menken and lyrics by Howard Ashman, with additional songs composed by Alan Menken and lyrics by Tim Rice. The book was written by Linda Woolverton. Show-stopping production numbers that highlight the singing and dancing talents of the ensemble are audience pleasers to be sure. The rich score is ably presented by Ross Scott Rawlings and his six-piece orchestra. Yet, it is the fairy tale itself that sweeps you away on an emotional and romantic journey. The story of a spoiled prince who had been transformed by an enchantress into a boorish, hot-tempered, unsightly creature (Russell Sunday) until he can find love and return to his human form before petals fall off from an eternal rose given by the enchantress and a beautiful woman Belle (played by Nicki Elledge) from a provincial town is tender and endearing. This relationship has the audience rooting hard for both. Also pushing hard for the couple to fall in love are various servants in the prince’s castle who were converted into enchanted household objects when the spell was cast on the prince. They, too, have a stake in the spell being removed so they can return to being humans. Simultaneously, the town’s egomaniacal, bicep-flexing, bully, Gaston (David Jennings), rejected by Belle to be his wife, strives to make her change her mind. David Jennings romps through his role as the superior, perfect-looking God’s gift to women, Gaston. His character, though an antagonist, provides most of the comic relief throughout because of his over-the-top self-centeredness and swagger with the amusing help from Lefou, Gaston’s goofy, ever-fawning sycophant, played deliciously by Jeffrey Shankle. Mr. Jenning’s commanding baritone in “Me,” “Gaston” and “The Mob Song” is on display. As mentioned earlier, because of the spell, the Prince’s-then Beast’s staff had been turned into such objects as a teapot, Mrs. Potts played by Lynn Sharp-Spears. Her rendition of the title song in the second act was performed sweetly. Other characters in this group include Cogsworth, the head of the castle and who converted into a mantle clock (David James); Babette, the enchanted feather duster (Elizabeth Rayca); the suave Lumiere, the maitre d’ of the castle and enchanted candelabra (Jeremy Scott Blaustein); former opera diva Madame de la Grande Bouche, the enchanted wardrobe (Jane C. Boyle); and young Chip, the teacup and son of Mrs. Potts (Nathan Pham). All perform brilliantly in their mostly comic roles as foils to the Beast. Also, turning in a solid performance is the always reliable Robert John Biedermann 125 as Maurice, Belle’s inventor-father thought to be crazy by Gaston and the townsfolk. Production numbers, such as “Gaston,” “Be Our Guest,” and “Human Again” involving the ensemble are extraordinary in their execution of Mr. Minnick’s choreography. Precise throughout, these numbers are simply sensational. AJ Whittenberger, a member of the ensemble, is dazzling in his acrobatics as a carpet in “Be Our Guest.” If this was gymnastics, he would have garnered a sterling 9.5 in the floor exercise. Rounding out the energetic, talented ensemble are Justin Calhoun, Andrew Horn, MaryKate Brouillet, Coby Kay Callahan, Samantha McEwen Deininger, Rachel Kemp, Julia Lancione, Kyle Louviere, RJ Pavel, and DeCarlo Raspberry. ...this mounting of Beauty and the Beast soars to a new level. With the talent overflowing and the technical crew’s skill, Toby’s presentation of Beauty and the Best excels in all facets from direction to staging to performances. 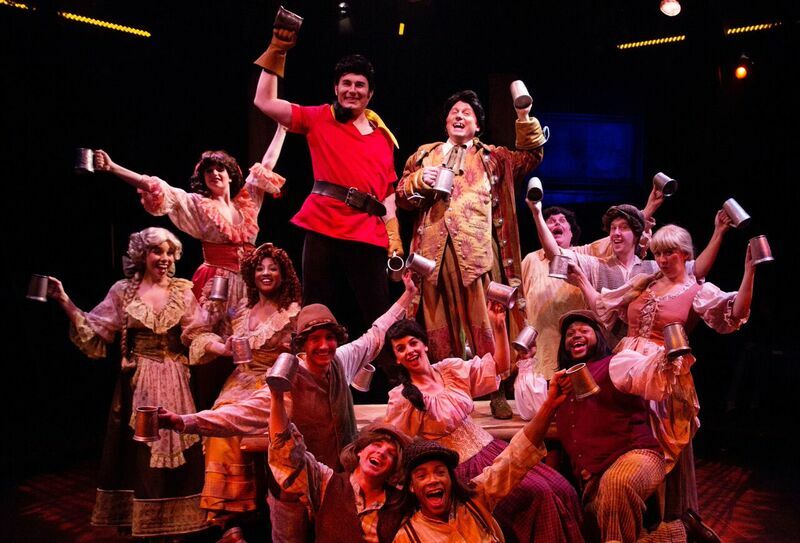 This production proves why the musical has received such worldwide popularity. No matter our age, we can all enjoy a good fairy tale with a happy ending to brighten our lives. Beauty and the Beast runs through June 11 at Toby’s the Dinner Theatre of Columbia, 4900 Symphony Woods Rd., Columbia, MD 21044. Tickets may be purchased by calling the box office at 410-730-8311 or visiting tobysdinnertheatre.com.